CHAUVET®, a leading manufacturer of LED lighting, plans to showcase new LED fixtures ideal for the mobile DJ and club environment at LDI 2011. These fixtures, which include headliners such as COLORrail™ IRC , LFS-5 , MotionDrape™ LED and MotionFacade™ LED , will be displayed at booth 175 during the 2011 LDI tradeshow taking place October 28 – 30 at the Orange County Convention Center in Orlando. COLORrail™ IRC is a powerful linear wash/effect light which achieves color mixing almost instantaneously by using 320 tightly packed and evenly distributed 10mm RGB LEDs. Nearly identical to its COLORrail™ counterpart, COLORrail™ IRC can be controlled wirelessly with an easy-to-use infrared remote control and doesn’t have to rely on DMX. The user also has the option to use DMX to control color in up to eight different sections or implement over 30 captivating automatic or sound-activated programs, which include chase and runway effects. LFS-5 is a compact, easy-to-use framing spotlight, which projects a hard-edged white spot and is powered by a 23-watt white LED. This lightweight fixture utilizes a 16- to 24-degree zoom and internal framing shutters you can easily size and mask light off unwanted surfaces with precision. A single gobo slot houses one of four included gobos, as well as a custom-made or print-at-home version. Achieve nearly any color with its removable gel frame. MotionDrape™ LED, is an animated, 9.8-by-6.5 foot backdrop drape powered by 176 high output, tri-colored SMD LEDs for full, color-mixing capabilities and wide viewing angles. 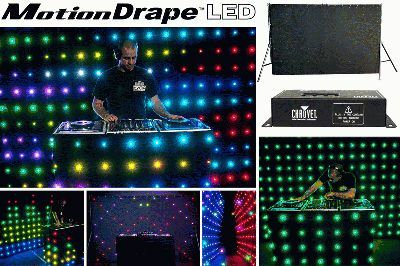 Ideal for any mobile performer, this drape features 30 eye-catching motion graphics, ranging from a multicolored rain effect to a graphic equalizer effect, and includes dimming capabilities. MotionDrape™ LED has grommets on all four sides to make hanging a breeze. MotionFacade™ LED is a perfect companion to MotionDrape™ LED , MotionFacade™ LED is an animated, 6.5-by-3.3 foot front board drape system powered by 66 high output, tri-colored SMD LEDs. MotionFacade™ LED has the same great built-in motion graphics as the MotionDrape™ LED, which are accessible in standalone mode or via DMX for a synchronized show. This drape includes grommets, hanging loops and Velcro® for multiple mounting options. Both drapes include automatic and sound-activated programs and provide you with control over the speed of patterns as well as their static color selections. Operation is a breeze with the included controller, and custom shows are easily created using eight channels of DMX. Crafted from certified flame retardant velour, each drape includes a free bag to simplify storage and transport.